1. Preheat the oven to 220ºC, gas mark 7. Tip the vegetable mix onto a lightly greased baking sheet and cook for 20 minutes, turning halfway. Stand for 10 minutes. Meanwhile, tip the tomatoes into a sieve over a bowl so the juice drains. 2. Finely slice the onion. Tear up two-thirds of basil leaves. And add the garlic, vinegar and olive oil to the tomato juice, and mix. Slice the rolls into a salad bowl. 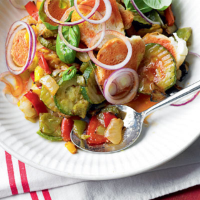 Add the grilled vegetables, half the torn basil, onion and tomato dressing. Mix then pile onto plates. Spoon over the remaining dressing and serve with the remaining onion and basil. This recipe was first published in Tue Jul 05 12:25:00 BST 2011.